I hope everyone is ready for Roger Clemens to make the long, painful transition from controversy-dogged outcast to wizened baseball mentor, because it's going to happen. With two bizarre perjury trials and a flirtation with an MLB cameo in the rearview mirror, Clemens is turning his thoughts to coaching. And the Astros, their mancrush unabated, are willing to indulge him. 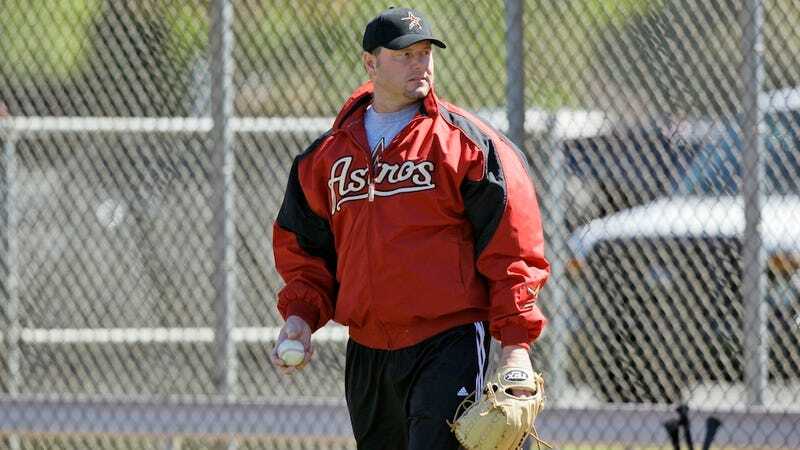 The Houston Chronicle reports that Clemens is nearing an agreement to take "an active role" with the team, in its first season in the American League. It sounds like it'd be as a "special instructor," that catch-all term that allows retired-but-still-beloved players to show up for spring training and pregame workouts to impart wisdom, and also to keep from wasting away because they just don't know how to live without being around baseball. The Astros plan to open their 2013 schedule to Clemens, allowing him to participate as much as he wants during spring training and the regular season. Owner Jim Crane and pitching coach Doug Brocail are onboard with the move, which would see Clemens take a role he's often hinted at since retiring in 2007. "So far, all indications are he's eager to participate, eager to help our young pitchers. And certainly, there's a lot of (acceptance) on our side to get him involved," [GM Jeff] Luhnow said. "So yeah, we're moving ahead. A lot of the things we teach … a lot of the things we want our pitchers to model themselves after, Roger's the perfect example of them. So it's great when you can produce him in the flesh and he can talk about his experiences." We've seen this before. Mark McGwire went from anathema to respected championship-winning hitting coach seemingly overnight. Now he's landed one of baseball's plum jobs with the Dodgers, a team without the emotional attachment required for the initial forgiveness. It's just that easy—put your head down, work, and everyone will forget all the bad stuff. All that's left for Clemens to go down this path? The teary confession. Not that anyone cares anymore, but it'd be fun to hear.